"The state's Forestry Department erected a 40-foot forest fire watch tower on the summit of Harts Hill in the spring of 1913 to replace a similar tower on Bear Hill. The four-cornered steel framed tower was supported by four strong steel posts firmly cemented into the ledge at the summit of the hill. The lookout was another seven to eight feet higher, bringing the total height of the structure to nearly 50 feet, or 285 feet above sea level. 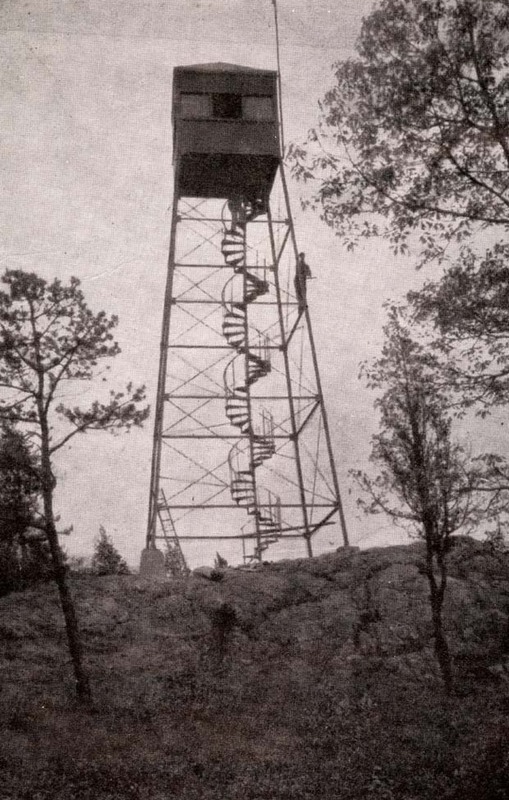 The forest fire watch tower had glass windows on all four sides that provided an unobstructed view for several miles in all directions, 'as far as the western part of the state and the southern part of New Hampshire.' The first watchman was Henry Fay, the firefighter with the longest years of service. He was selected for the job, and paid, by the state Forestry Department. His equipment consisted of powerful glasses, a chart of the country 'round about,' a range finder and a telephone number (512-M). If he spotted a fire, he called the nearest fire department or fire warden. It was reported that he would be able to see a fire 10 to 15 miles away, and when he 'gained complete familiarity with his apparatus, could place it as close as 100 to 200 feet.' The Town voted in 1912 to pay $350 for public access to the tower. An iron stairway at the northwest corner was built so that ladies would not be 'inconvenienced.' On May 1913, over 400 people took advantage of the public opening." -- Text from calendar by Jayne M. D'Onofrio. “Harts Hill forest fire watch tower, 1913,” NOBLE Digital Heritage, accessed April 20, 2019, https://digitalheritage.noblenet.org/noble/items/show/6971.